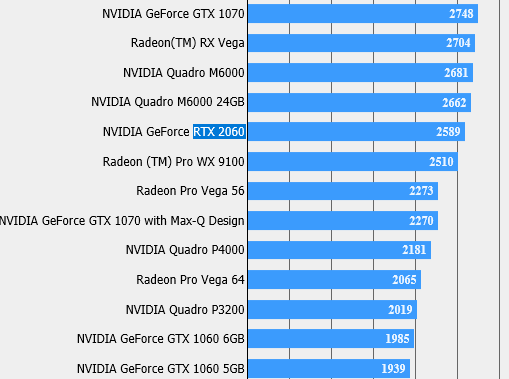 Yet unreleased GeForce RTX 2060 graphics card has been discovered by APISAK in Final Fantasy XV benchmark database. Interestingly, the leak would suggest that NVIDIA’s upcoming mid-range model is still featuring RTX branding, not GTX as previously speculated. This would indicate that even mid-range card would feature RT Cores and possibly even Tensor cores. The leak puts RTX 2060 between GTX 1070 and GTX 1060 6GB. Performance-wise the mid-range card would be twice as slow as RTX 2080, which scored 4880 – give or take. Which means the RTX 2060 would follow the footsteps of their predecessors in terms of where the model would stack in the series. However, it is also very unlikely that this card will follow GTX 1060 in terms of pricing.